Yadier Molina tried to play through the pain as best he could, but his hand injury kept him from being 100 percent. Indicative of the type of player he is, St. Louis Cardinals catcher Yadier Molina played through a painful torn ligament in his left hand for the first three games of the Cards’ NLDS loss to the Chicago Cubs. 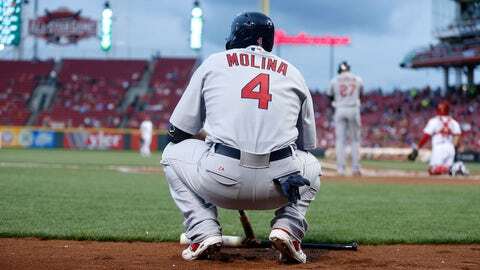 For Molina, ever the picture of a ‘team first’ type of player, the pain became too much after a particularly aggressive swing in Game 3. Derrick Goold of the St. Louis Post-Dispatch noted that after that game Molina was unable pass the strength tests administered by the medical staff, and thus was a scratch in the team’s series-deciding Game 4 defeat in favor of Tony Cruz. As a result, Molina was set to have an MRI on Wednesday that would help determine whether he needs surgery to repair the hand. The procedure was admininstered Wednesday night, and GM John Mozeliak told Goold an official update will be announced sometime Thursday. Goold quotes manager Mike Matheny as describing the concept of playing through pain. Mainly, it’s, "different than not being able to do it with the normal strength that you would like to have. I think the difference is that he was in a different spot strength-wise. He was not able to really even grab the bat. A little bit of rest helps things calm down, and when it’s calm you’ve got a little more strength." As for Molina, who would have had the MRI on Wednesday whether the Cards won or lost Game 4, he told Goold that, "I tried everything (to play). I tried everything." He definitely did try everything in order to help the Cardinals field the best roster possible to battle the Cubs, but in the end the nagging ligament issue proved too painful to allow him to play at a 100 percent clip. Now, he and the Cards can make sure he does whatever is necessary in order to be ready to go for spring training.